Menstrual headaches are from the most uncontrollable trigger - hormone fluctuations. The movement of my estrogen has ruled my adult life, or I'd rather say ruined my life. But that always sounds so dramatic. But my migraines are. Let me tell you how to cope better and even stop them in their tracks. The most painful symptom of migraines is the headache phase, of which there are four (four phases). The other symptoms can include one or many. Some common symptoms are: sensitivity to light, sensitivity to smells or noise, nausea, vomiting, and disturbances in vision (auras). If menstrual headaches are causing migraines, they can be frightening and disturb your life. The more severe and chronic they are, the more destruction in your life. A first step is to start keeping records around your period so you can take them to your physician's appointment. S/he will look for a pattern. Your treatment will depend on your pattern, so this part is important. Here is my migraine diary if you'd like to print it out and use it. Fifty percent of women that suffer migraines report that their menstrual cycle affects their headaches. The menstrual cycle reflects biological changes that occur in our bodies each month. These chemical changes effect every cell in our body, every minute of every day. Some of us women are more sensitive to the changes in our hormones during the menstrual cycle then others. Everyone is different. With age, things change. A woman becomes less fertile as her ovaries gradually stop producing eggs each month. This is called menopause. It starts with peri-menopause which is the period between the time when periods start to become irregular and the time they stop. Menopause is the time when your period stops completely. The length of time this cycle takes can vary with each person. The average age for menopause to start is between the age of fifty-one and fifty-two. But some women reach menopause as early as forty and others may not reach menopause until sixty. Peri-menopause started for me at the age of thirty-two. I had not even heard of it before and spent years in disbelief. You might find that your menstrual headaches occur just two days before your period is due, and can continue for the next seven or eight days. The ovaries manufacture less estrogen and the changes in your hormone levels can make migraine attacks more frequent and more severe. Because of the connection between hormone levels and migraines, the experts think that the headaches can intensify as we begin the menopause cycle. However, for most women, the migraines have a tendency to slack off after the early years of menopause. Everyone is different. I know I keep saying that, but we are. Even when you are in menopause, the hormonal cycle can continue for some years, although typically these hormones are not sufficient to result in menstruation, they can still provoke menstrual headaches and migraines. These hormones can act as a trigger for migraines for approximately two to five years after menopause begins. At this time non-hormonal triggers may become more obvious. Your attacks can be less predictable than before. The changes which are experienced during menopause such as hot flashes, night sweats, disturbed sleep, and stress, can also be triggers that can set off your migraines. I know, it all sounds like doom and gloom. Keep reading or scroll down to what to do now to stop the headaches. 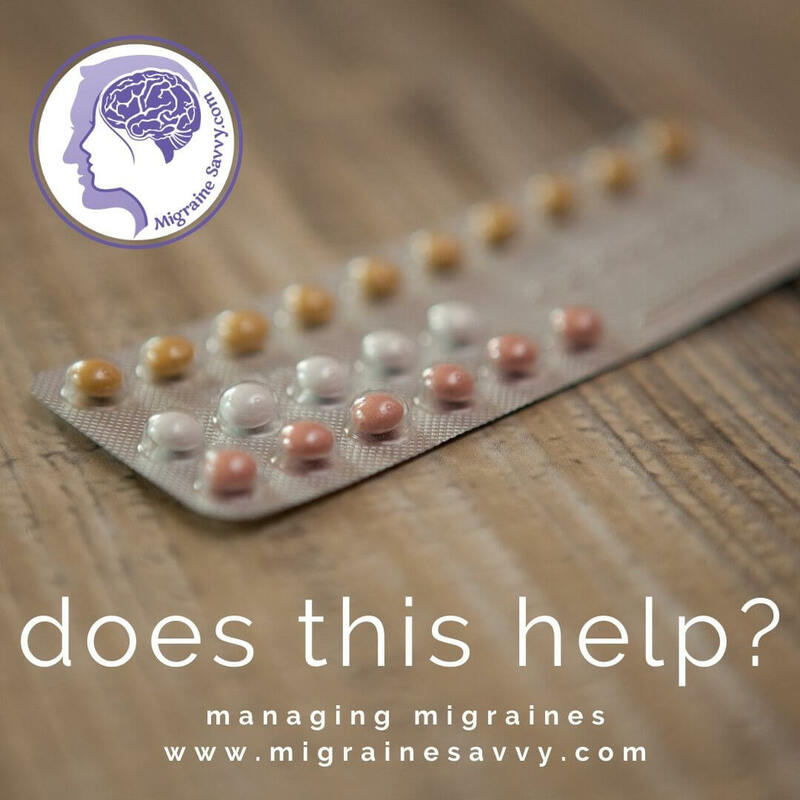 As early as 1966, studies have proven that migraines are more severe in females that take birth control pills, especially if these pills contain high doses of estrogen. The same effect did not occur with women that took birth control pills containing progesterone. Birth control pills are a major migraine trigger for some women. Approximately 10% of us women have migraine headaches only with menses. Therefore, in most females, hormones are only one of many migraine triggers. 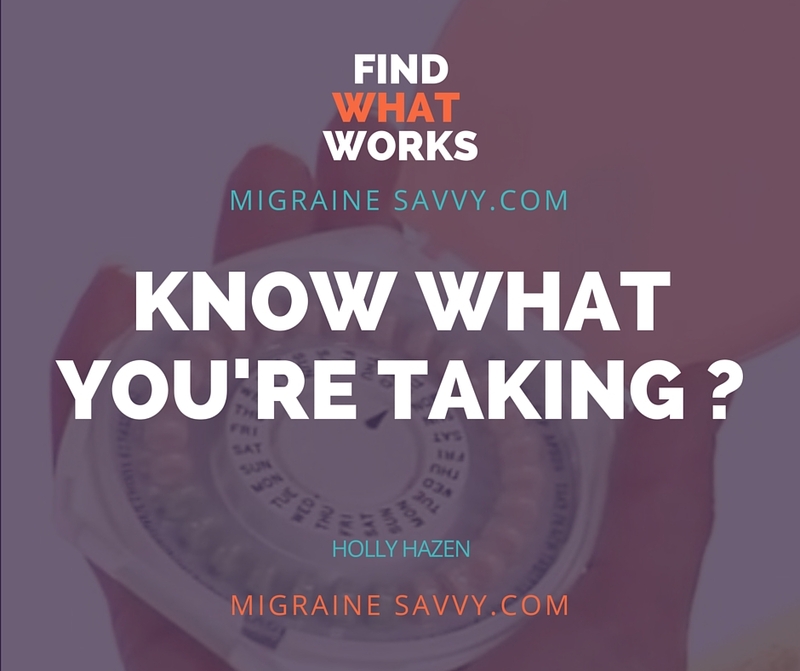 When I was diagnosed with migraines, the first thing my doctor did was take me off birth control pills. It had no effect, but in the recent years much has been said about the problems associated with long term use of birth control pills. 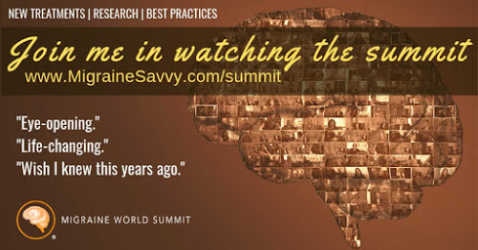 For one example, Dr. Andrew Jones in his book called The Natural Cure to Your Migraine Headache: What the Big Drug Companies Don’t Want You to Know sees migraine as a “worldwide epidemic” and cites birth control pills as a major contributor. I have found that doctors will prescribe synthetic hormone replacement pills now with both estrogen and progesterone. And natural practitioners will more commonly use bio-identical hormone creams. There are divided opinions in this field, so you may want to do some research first before choosing. I wrote a lot about this on Cure for Migraine Headache: Balanced Hormones Hope or Hype. Bio-identical hormone replacement therapy is more commonly used to treat the symptoms of menopause rather than migraine. But that's where my path led me. There has not been sufficient research to show evidence of the effects of this therapy on women who experience migraines. The hormone replacement therapy helps some women and aggravates other women, who suffer from migraines. It is trial and error. This treatment is not necessary for every woman and it is certainly not free of risks. I suggest discussing this with a few different people to gain some perspective. Your Doctor, your local pharmacist, and other friends who have already been through this could be very helpful. It is very important to trial the treatment you choose for a few months to give your body the time to adjust to it. You might feel it straight away, it depends how unbalanced you are. Just because you suffer from migraine attacks, is not a reason to avoid hormone therapy. Ask your physician about other risk factors. There is current research that shows that women who take hormone replacement therapy and suffer from migraines have an increased risk of stroke, but not heart attacks. If you think hormone replacement will stop your menstrual headaches then trying the different delivery methods will be worth it. There are some women who tolerate taking hormones by patches instead of pills much better. Non-oral forms of hormone therapy in the form of skin patches or gel which you rub on your skin is also available. If one route does not work for you, then try a different one. Other options are to try herbal medicines and to make some lifestyle changes. Trial and error will help you get much better results reducing or completely eliminating your menstrual headaches. The first line of treatment for severe menstrual headaches is the designer family of drugs called triptans. They should be taken as early as possible, at your earliest warning sign and can be repeated if necessary. If you can predict the headache, then starting your preventive treatment one or two days before the anticipated headache is your best strategy. If your headaches are mild then you can take some over the counter migraine medication or something more gentle as prescribed by your physician. You can always ask the pharmacist for help too, they have a world of information at their fingertips. 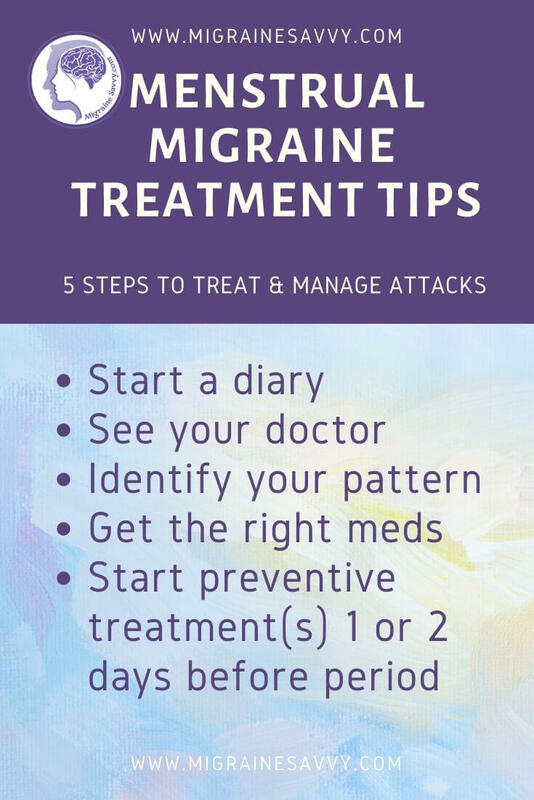 Please read migraine vs headache for more details on what medications to take for mild headaches. Each requires a different treatment. It's good to be crystal clear on this. Something with a muscle relaxant would be good, as is a hot water bottle for your sore belly. Talk with your physician about your headaches before taking birth control pills or hormone replacement therapy. There are medical factors such as high blood pressure, smoking and family history, and the type of headaches or migraines, which need to be considered prior to taking these. Some women may suffer an increased risk for serious medical consequences, so be sure to discuss the use of these synthetic or natural bio-identical hormones with your physician before making a decision. I was on progesterone cream and the other hormone creams for years and they never touched the side of my migraine attacks. What I mean is that the progesterone helped calm me down, but there was no change in migraine frequency, severity or duration. I am sure it helped balance other things, just not the headaches. I take Naramig (naratriptan) now for three days before my period, and then during. It stops my migraine attacks. Talk to your physician seriously about a pain management strategy now so you can find the best routine to prepare for the next attack. What Do You Do To Stop Your Menstrual Headaches? What did I miss? Leave any tips you have to stop getting headaches around your period below. Wouldn't it be nice if someone found a complete cure for PMS too!